Welcome to Workout Week 2 of my BodyRock Workout series! If you haven’t checked out Week 1 yet, you can find it here: BodyRock Bootcamp Week 1. One workout from the full 10-Week Workout series is being released weekly at BodyRock.tv. 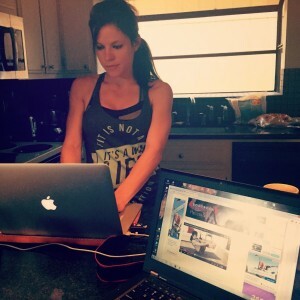 Blogging in San Francisco while Rose & Nicole Check out my Newest BodyRock Workout! Here is a suggested workout schedule for Week 2 to incorporate the newest workout (video below) into your week! You can click the link for the full workout breakdown, or follow along with the videos. You can choose to follow the schedule below, pair this workout with the new workouts I am releasing this week, or add it to your normal workout routine. Remember, you want to make the workouts fit into your schedule. I’m am OT too! No wonder I loved your workouts! Where did you get your “fit is not a…” tank? Always great workouts! Thank you!! !